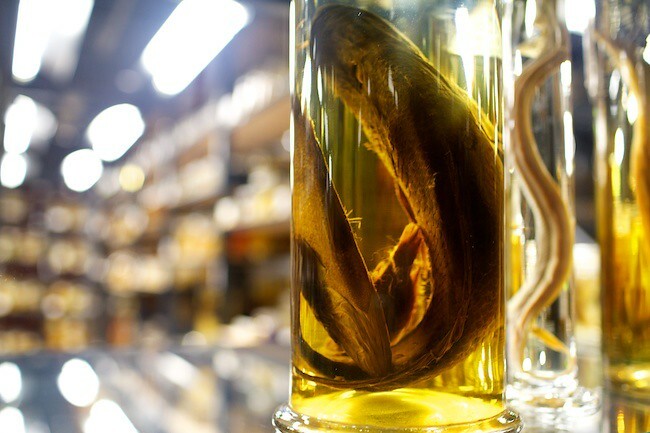 Visiting the Wet Collections in the Museum für Naturkunde is a little like that scene in Alien: Resurrection when Ripley happens upon a room full of freakish alien experiments in jars. 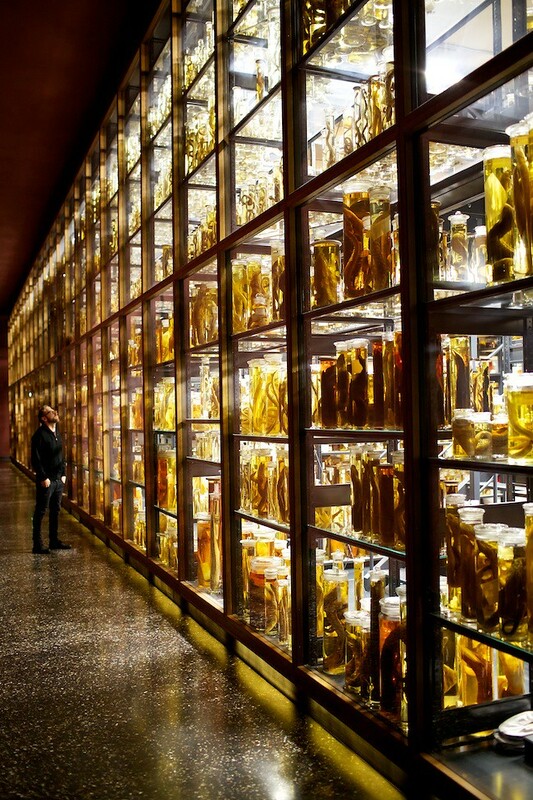 The fact that the one million specimens were collected here on Earth doesn’t stop them appearing other-worldly in their glowing jars of ethanol, and some of them downright facehugger-y. The climate-controlled conditions in the museum’s East Wing, completed in September 2010, mean that you even have to go through a kind of airlock to get to it. 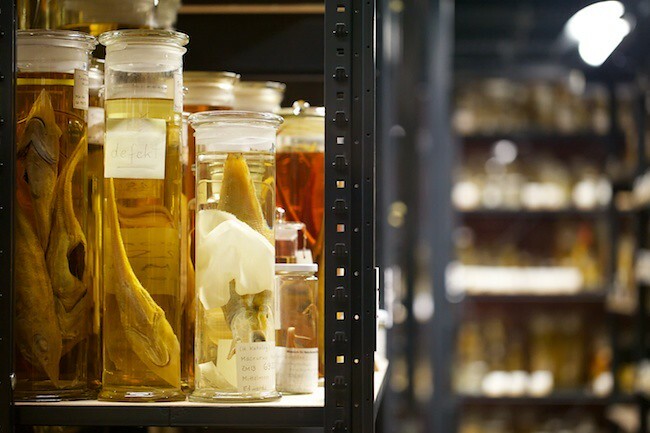 Berlin’s Natural History Museum is fast establishing itself as a rival to those in London and New York, but we advise you to stride straight past its main attraction – the largest mounted skeleton in the world – and marvel at the mad creatures we share the planet with today. Amazing images. I’m visiting the museum for some work experience soon. 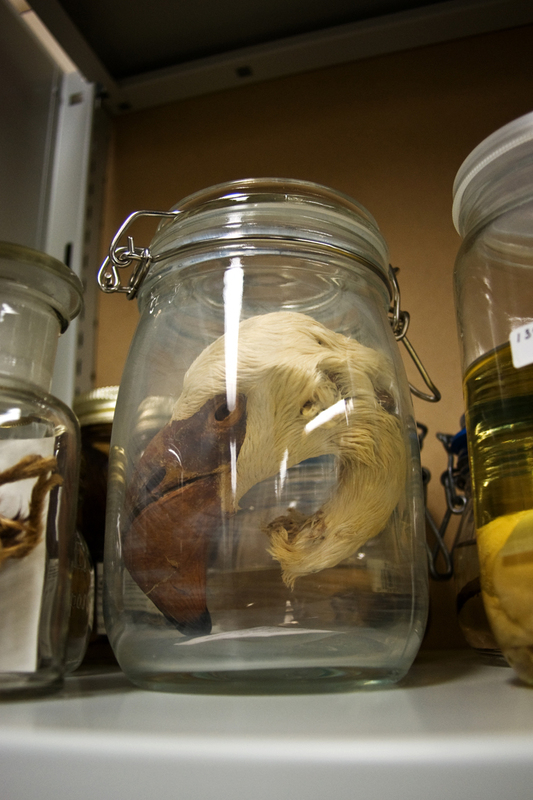 I’m a natural history curator trainee and have been photographing spirit collections in different places. 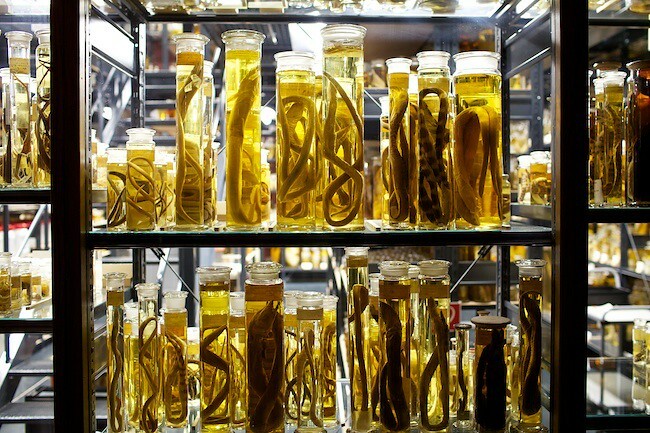 You should defo make it to the Naturkundemuseum some time, you’d be in your element! 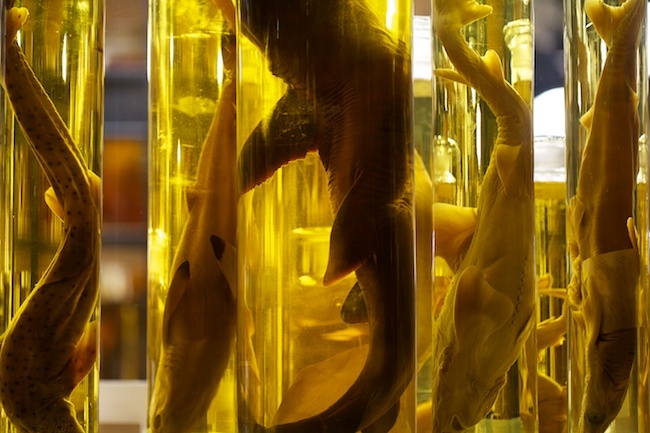 I’m off to Berlin tomorrow to spend the week at the Naturkundemuseum. I can’t wait! Look out for some (hopefully) exciting posts! Sweet! Can’t wait to see some “behind the scenes” posts. Have fun! I never linked you up to my Berlin blog posts! You may have seen them anyway if you were following my blog. It all looks a bit different now. Thanks Russell, these look awesome. We’ll be sharing these real soon! The wet room wasn’t open yet when I went in there last year and made a video about it. 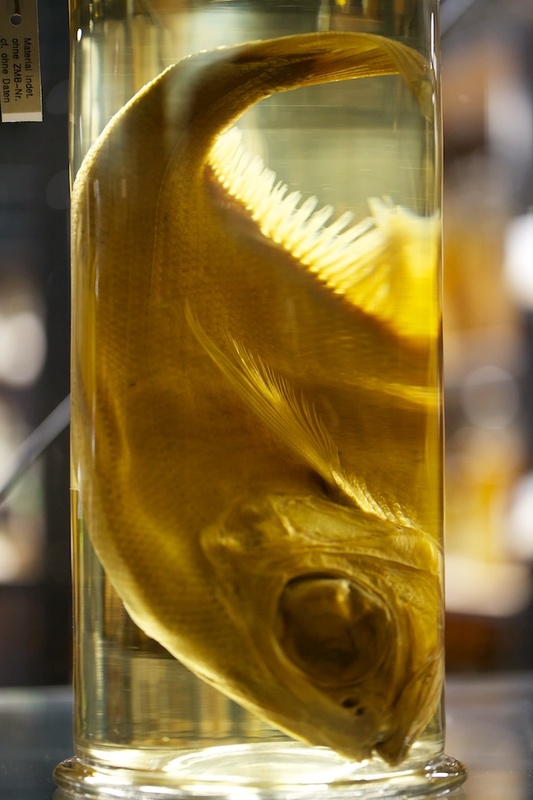 Fortunately, they already had some “wet specimen” in the old wing, which were the visual highlights, together with that very badly stuffed spotted cat. And I even showed the door to the still closed wing. Will have to go back now! As always, I love your macro shots. Thanks! Great video – was that Scott smacking his head off some glass?! what a place brilliant fotos as well will have to visit!!! yes definitely one to go and see! Breathtaking wall of weirdness. Zoe must be itching to photograph a fashion shoot there. I love this place! But I’ve never seen this room. Finding it next time. It’s easy to miss! Head straight to the back, hang a right before the dioramas and head to the end of that corridor. The “airlock” is on your right. Well worth the price of admission alone – spectacular. Win 2 x 2 tickets to Between the Buried and Me! Help make Berlin’s first alternative comedy stage a thing! Learn High-end Retouching with Pratik Naik at überlin!